"You Will See Me No Longer"
It was in late April that I began preparing the readings, hymns and sermon titles for our worship for the month of May. The sermon titles were based on the sayings of Jesus – his words to his disciples. They were all drawn from the lectionary readings from The Gospel According to John. Last week Jesus’ words to the disciples was: “You are to testify.” Today, the title for the sermon is: “You will see me no longer” (John 16:10). That also comes to us from a reading found in The Gospel According to John. But I realized earlier in the week that the phrase does not come out of our lectionary reading for this morning. Instead, it comes from a portion of our reading from last Sunday. Jesus is again speaking to the disciples. He is aware his death is near and so he prepares the disciples by seeking to reassure them the Holy Spirit will bear witness with their spirit that they are children of God (Romans 8:12-17). That is affirmed in our reading from The Letter of Paul to the Romans. Still I do not remember why I would title today’s sermon “You will see me no longer” (John 16:10). It occurred to me yesterday as our church family gathered here to remember and celebrate the life of Keith Campbell that the words kept coming to my mind – “You will see me no longer.” It was not so much Jesus’ voice as it was Keith’s voice – “You will see me no longer. Keith died on May 8, 2018 at his home in Paukūkalo after being diagnosed with pulmonary hypertension several years ago. Even as his health declined, Keith remained an active member of this church. Since his death the phrase “You will see me no longer” has come up for me on several occasions. I imagine that Keith was saying to those of us who knew and loved him, “You will see me no longer.” It was then that I began imagine how the disciples must have felt knowing that Jesus was going to die. I began to wonder how the disciples felt knowing that Jesus would soon be gone; that he would no longer be with them. Jesus made a promise that God would send the Holy Spirit to guide them; that the Holy Spirit would remind them and bear witness to them that they were “children of God, and if children, then heirs, heirs of God and joint heirs with Christ” (Romans 8:16-17). That gift of the Holy Spirit is a gift not only to the early disciples but to all of us. The early disciples spoke of what they knew and they testified to what they had seen in the three years that they were with Jesus. They loved him and he loved them. Do you speak of what you have known of their lives and do you testify to what you have seen? I heard Keith’s voice this week – “You will see me no longer.” So, I will speak of what I know and testify to what I have seen. In 1998, Keith and Pilialoha Teves served as Co-Chairpersons for the 10th Annual Hawaiian Choir Retreat. We hosted the gathering here in Mākena for the first time in August of that year. It was at that choir retreat the hymn “Nā Pua O Ke Akua: In God’s Flower Garden” was included in the music that we were to learn over the weekend. The lyrics were originally written and translated by Keoana Hanchett as a poem for children. The music was by Ned Ka‘apana and the arrangement by Danny Brown. When we asked Keoana for permission to put the words of her poem to music, she explained that the kaona or hidden meaning in the phrase nā pua while literally meaning “flowers” was, in fact, a reference to “children.” In other words, in God’s flower garden grow children of every color. It is a vision of the world that Keith understood and with his kōkua along with Pilialoha’s help, we were able to share that vision with those who came to us in the late summer of 1998. In the fall of the following years, members of our church met and approved a “Resolution to Form a Long Range Planning Task Force.” Keith accepted the invitation to serve as the facilitator for the task force. The resolution included a two-year timeline with the understanding that recommendations would be made no later than the annual meeting in January 2002. An open invitation was extended to General Members to serve on the task force. I joined those who responded to the invitation including Danny Brown, Phil Christopher, Beth Gawain, Taka Harada, Judy Kapohakimohewa, Edie Kapiko, Boogie Lu‘uwai, Kathy Lindsay, Don Schneider, Linda Schneider and Jean Walker. It happened that there were twelve of us and Keith. That model of a working group of twelve was not lost on some of us as we thought about Jesus and the twelve disciples. 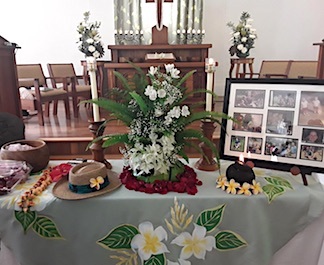 It was out of the work of task force that our ‘Ōlelo Mikiona or Mission Statement was developed and integrated into our worship service as a part of our weekly liturgy. Keith facilitated the discussion among the members of the church and task force. The words in our Mission Statement did not come from him but from the numerous conversations among members of the church and the task force. That is a declaration we have made each Sunday morning over the last sixteen years. “You will see me no longer,” Jesus said. “But the Holy Spirit, whom God will send in my name, will teach you everything and remind you of all that I have said to you” (John 14:26). “ . . . love one another just as I have loved you. By this everyone will know that you are my disciples, if you have love for one another” (John 13:34-35). But I will remember. I will remember Keith. We will remember Keith and we will remember others whom we have loved and who have loved us.